Finding the right tools to keep on gardening kept Cilla active and healthy. Cilla, aged 67, lives with her husband in a three-bedroom house with a garden. Her husband has recently retired and they both enjoy being outdoors, gardening and entertaining particularly in the summer time. She has osteoarthritis in her hands and knees. Cilla's much loved mother died last month and her mood is low as a result. Due to her arthritis she has been finding it more difficult to undertake the gardening tasks she enjoys including any tasks that require kneeling, such as planting. Her husband is active doing more of the heavy work in the garden and she wants to be able to join him outside now they have more quality time together. Some of the handgrips and attachments for tools would fit her existing tools, meaning that she could keep using her old favourites. To avoid bending down whenever possible, she identified some of the kneeling stools to enable her to get down to ground level more easily. The kneeler she chose was lightweight and easily portable. 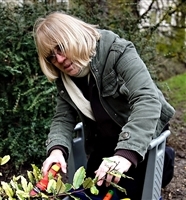 She was able to comfortably kneel down on the padded seat to plant the annuals she had bought from the garden centre and the handles helped her to stand up again. She was then able to sit on the stool and prune her rose bushes. The secateurs made the pruning much easier. She was able to plan further projects for her garden so she had more colour throughout the year.